Fantasy always has that lasting effect on the mind. It creates an aura of awe and inspiration and leads is to believe in the fiction. It all becomes real in front of the eyes as it mesmerizes and captures it all even with the tiniest of thoughts or long prose. Author Shobha Nihalani in her second book of the Nine trilogy "Nine: Vengeance of the Warrior" brings back the age of barbarism mingled with modern day fears and some good old fantasy. So has she been able to provide an all conquering story? Let's find out. And therefore, the end is only the beginning. After burying the vicious Kalingan warrior, Akash, Tara and Zubin are continuing their lives as before, hiding the fact that they are a part of King Ashoka's exalted Nine and that each of them has powers meant to be used for the benefit of mankind, when needed. Except, things are not as quiet as they seem to be. The Kalingan warrior has risen once again angrier and more vengeful. And this time he knows each one of them. If they don't destroy him now, they will be hunted down and the world will be battling its worst, most terrifying chemical warfare yet. First look at the title and the cover and the exhilarating look gives a great feel to it. The title itself speaks volumes of what is bound to be part of the book. The blurb is short and sweet but it gives away the important scenario of the story which should have been completely avoided at all costs. The story starts off from where the first part of the book as the Kalingan spirit has returned to earth more deadly and filled with rage and revenge. 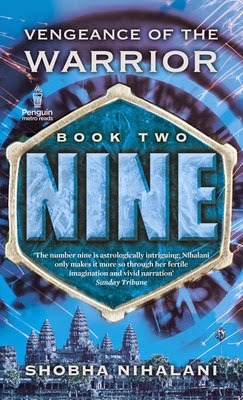 But the Nine are weary and they are banking on their Three's past experience to finish it off once and for all. But the path is not so easy this time. The determination of the Kalingan with the quench to conquer and rule the world is insatiable and it will only rest till the time it doesn't destroys the legacy of Ashoka. So who will prevail in this all out war? Will it be the evil or will the good will prevail once again? That's what the story is all about. The story is set off in a similar motion as it was in the first part of the book. It expectantly has a lot of action and a very strong antagonist and given the challenge and the methods to achieve the desired destiny it manages to pull off quite a few heart pounding scenes in the story. There is a good old battle with a lot of fantasy and angst that will help the readers move along with excitement and curiosity. The book clearly lacks a great story line as all the action and pent up emotions goes waste. It's predictable nature gives it away all and the deadlock becomes too monotonous and exaggerated. Not to forget the character build up and the time taken to provide appropriate momentum snatches away crucial points away from the story. The lackluster end also doesn't adds up to the entire cause and what could have been a vengeful story turns out to be a pauper in the end. All in all what promise lay hold by the first book fails to ignite the same passion in the second. The story is way too much straightforward and messed up and not laced with hard hitting pointers. The individual ramblings of the characters is a huge sore and eats up a lot of the main chunk. It could have been a vengeful revenge but the lack of proper approach fails it all and leaves it absolute shambles.